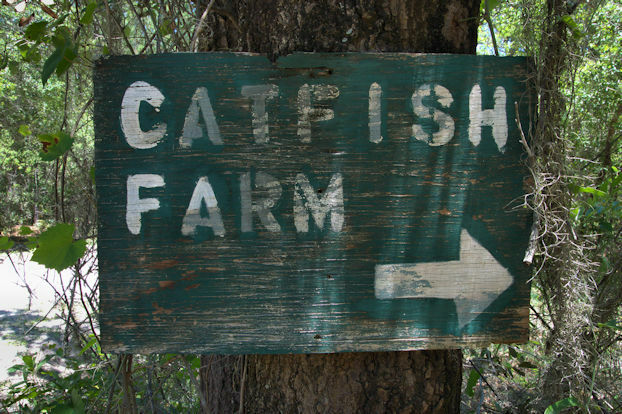 I don’t know anything about the catfish farm, but the redbreast and bluegills have been drawing fishermen to Burnt Fort on the Satilla for generations. My father has great memories of fishing here when he was a boy in the 1950s. At least two different explanations of the origin of Burnt Fort can be found in a general search of available sources. 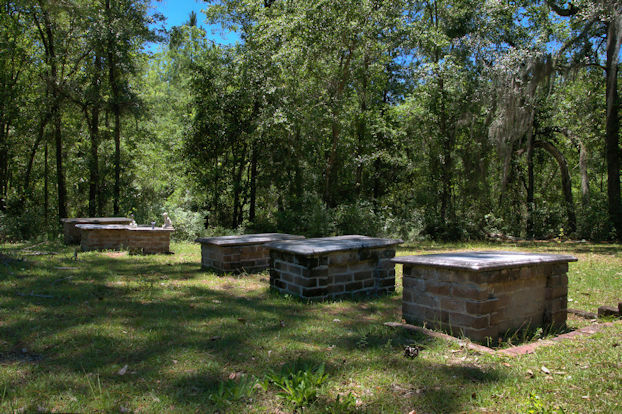 One account suggests that South Carolina built a fort circa 1715-25 along the banks of the Satilla River near this location [Georgia didn’t yet exist]. 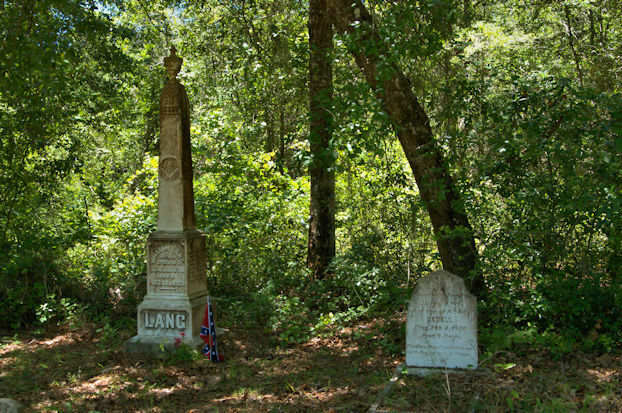 The most interesting evidence, though, centers on Edmond Gray, who came to Georgia from Virginia bent upon opening the “neutral lands” between the Altamaha and Satilla Rivers. He and a small group of followers settled upon a site near here in 1755 and named it New Hanover. As the land was in dispute between Great Britain and Spain, the English sought to destroy the colony to avoid a confrontation with Spain and further rousing the native Creek Indians. In late January 1759, Major Henry Hymes of South Carolina and James Edward Powell of Georgia were dispatched by Colonial Governor Henry Ellis of Georgia to destroy the town. Gray complied and was given 28 days. He ordered the settlers to vacate but some remained and operated a small trading post/fort for a time. It was burned soon thereafter; whether by the Creeks or other force remains unclear. The name Burnt Fort was firmly established at least by 1793, when Captain James Randolph built Burnt Fort Station for his squadron of dragoons charged with protecting Camden County from the Creeks. 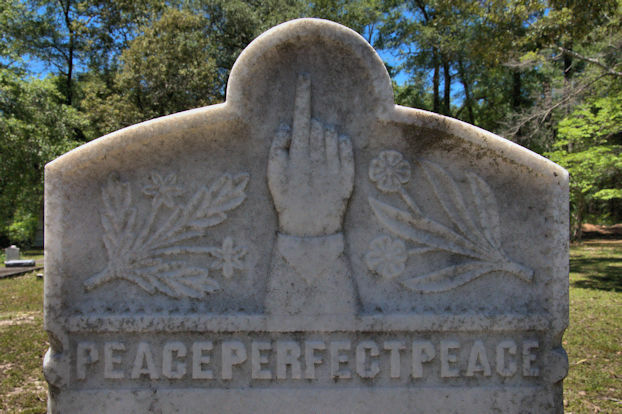 Whatever the real story, it’s a fascinating chapter of Georgia history and bears further inquiry. I will update as I learn more. 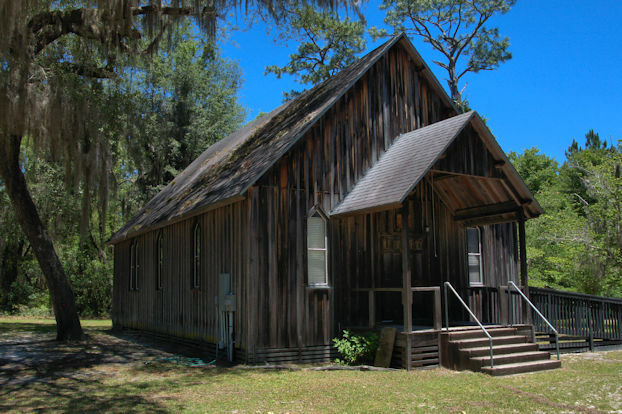 A multi-denominational congregation at Burnt Fort dates to at least 1872, though burials in the cemetery date to the early 19th century. The first church was in use until 1947, when declining membership led to its closure. The structure was abandoned and had collapsed by 1960. Area residents, including descendants of the founding families, came together in 1976 to rebuild the church, which was dedicated on 4 September 1977. Of special note in the cemetery are are the six crypts of the Hedleston children, dating to the 1850s. 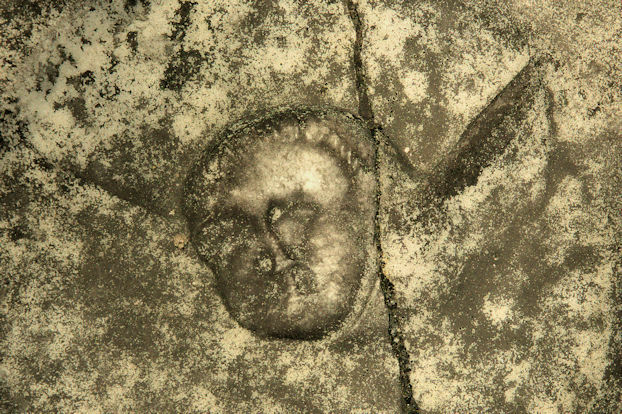 Most notable are their winged death head reliefs, such as the one seen below. A good variety of typical funerary iconography can be found here. Considering there are a number of unmarked but documented burials here, it would be interesting to know if there was indeed a congregation in the early 1800s to serve the thriving community of loggers and timber workers in the community. 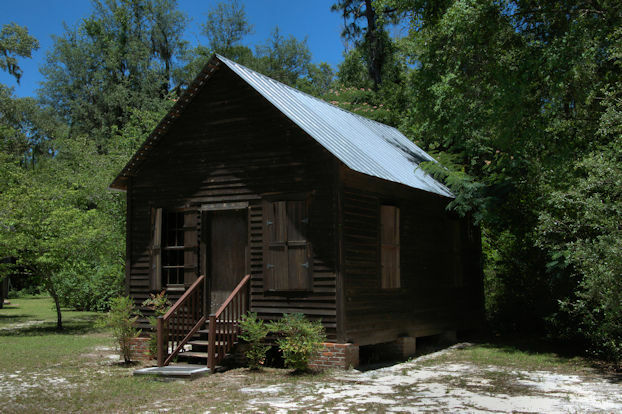 Located adjacent to Burnt Fort Church, this schoolhouse was moved by oxcart in 1918 from the nearby Mid River community. 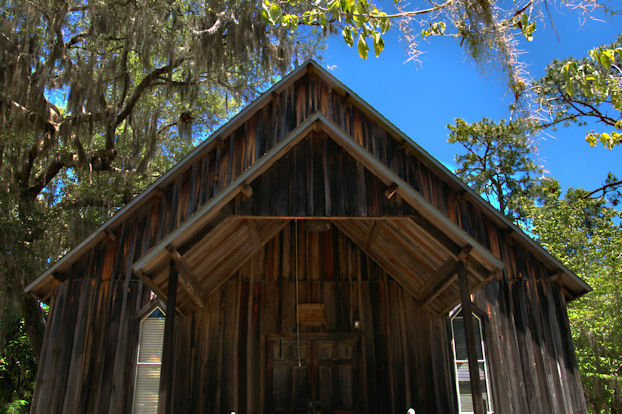 Closed in 1922 and in disrepair for many decades, it was saved through the efforts of Stokes Davis and the Burnt Fort Chapel, Cemetery & Historical Association around 2001.